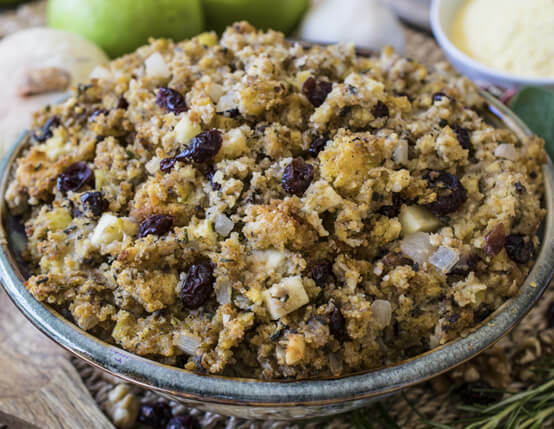 This cornbread stuffing will add a southern-flare to any table. 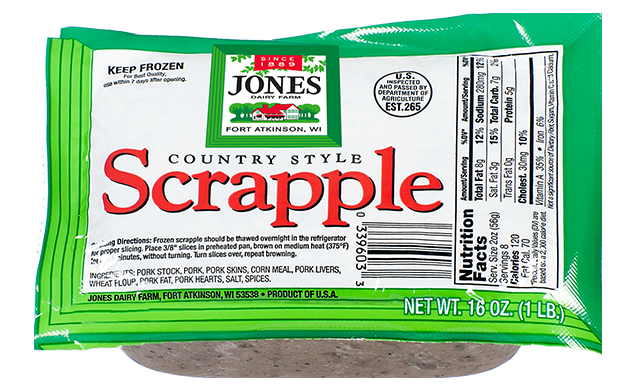 Fresh apples and dried cranberries pair wonderfully with savory Jones scrapple. This recipe is made with Jones Scrapple. Important Note: The corn meal in this recipe soaks overnight before the corn bread is baked so be sure to leave yourself enough time. Also, once the corn bread is baked, it needs to be cubed and dried out for two day, so again, leave enough time. To make cornbread, in small bowl combine corn meal and buttermilk; cover and let soak overnight at room temperature. The next day, preheat oven to 350⁰F. Place bacon fat in 9-inch square pan and place in oven while mixing remaining ingredients. In large bowl, sift together flour, baking powder, baking soda and salt. Add granulated and brown sugar; stir and set aside. In medium bowl, mix melted butter with honey. Add eggs and stir. Add egg mixture to soaked corn meal and stir. Finally add wet ingredients to dry and stir to combine. Remove hot pan from oven and swirl hot bacon fat around pan. Pour batter into hot pan and place back in oven and bake 30 minutes or until center springs back when touched. Remove from oven and cool completely. Slice into 2-inch cubes. Lay cornbread cubes out on sheet pan and leave out at room temperature for two days, turning once. Preheat oven to 350⁰F. In large sauté pan, heat oil and butter over medium high heat and add onion, celery and salt. Sauté 4 minutes then lower heat to medium and add scrapple, garlic, sage and rosemary; sauté 3 minutes, scraping pan with wooden spoon so nothing sticks. Add half of stock and scrape up any brown bits from bottom of pan, then remove from heat and set aside. In large bowl, place stale cornbread, walnuts, apple and cranberries. Add scrapple mixture. Using your hands, work meat mixture into cornbread mixture breaking up any large pieces of cornbread. Slowly add second half of stock and only add what is needed to get t desired consistency. Spray 9x13-inch pan with non-stick spray and pour in stuffing mixture. Bake 40-45 minutes until browned on top and hot in center.